YummyInTheCity: Julie & Julia - Bon Appetit! 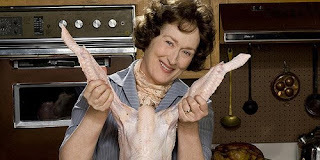 Julie & Julia - Bon Appetit! I went to see Julie & Julia this morning. Yep, that's right. Since I am very budget conscious right now I see all my movies before 12pm for half price. 10:30am for $6 bucks. It's actually quite nice - much less crowded, and it forces me to get up earlier than I ordinarily would on the weekends. It's amazing how much longer the day is when you get up before noon! Anyhow, I thought Julie & Julia was pretty awesome. My expectations were sort of low - I actually did not love the book (I actually abandoned the book halfway through). I think the material translated much better on screen - and come on, anything with Meryl Streep is just great. She truly is a film icon - how she so seemlessly disappears into her characters is amazing. I mean how she so elegantly portrayed Anna Wintour in Devil Wears Prada...and now Julia Child. Could there be two more different characters?? The film tells the story of Julia Child's foray into French cooking during her time in France while also telling the story of Julie Powell - a woman nearing her 30s trying to find herself in Queens by cooking her way through all 524 recipes in Child's "Mastering the Art of French Cooking." The two stories were wonderfully woven together transporting me back to France after the war and fast forwarding into the future in NYC post 9/11 without the awkwardness usually involved in these types of flashbacks. I'm going to try the boef bourginon next week of course! my :i had to make this dish" experience after J&J was the bruschetta! it looked so delicious in the film - mine was pretty damn good too!